attract both researchers and investment to the province for the ultimate benefit of all Albertans. The ACRC is a collaborative effort which works with a number of partner organizations. As a proud partner, Alberta Innovates is pleased to host information about the ACRC on this website. Alberta Innovates also provides project management and administrative support. Five principles form the foundation for the development of all of our projects. Learn more. Our strategic plan outlines priorities relevant to our stakeholders’ vision and presents action plans, key steps, and proposed projects to achieve desired goals. The Phase II Strategic Priorities align with our goal of increasing high quality, integrated, efficient clinical research in Alberta. Learn more. High quality research stems from training and a knowledgeable research team. We’ve developed the following table to guide individuals on the training courses that are recommended and applicable to their work. Learn more. 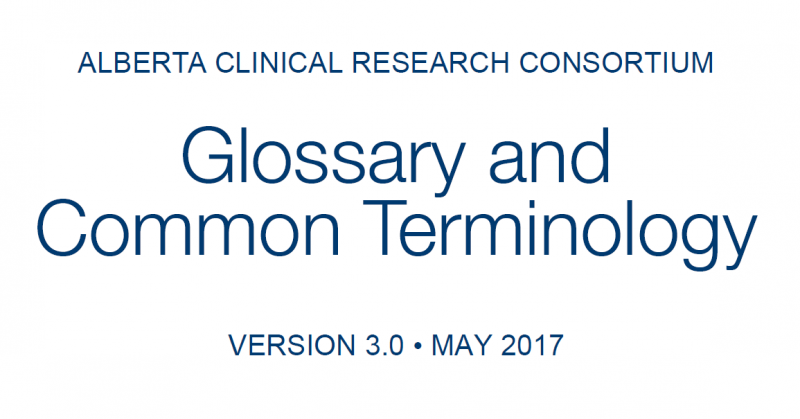 The provincial clinical research roadmap provides interactive step-by-step instructions on how to navigate a clinical health research study. Read more. Like every successful consortium, our value is in harnessing the knowledge, skills and expertise of its members. This means the ACRC incorporates best practices and the applicable regulatory guidelines thereby ensuring quality by design in all of its activities and outcomes. Learn more. The Clinical Research Source is an educative bi-monthly release that keeps the clinical health research community updated about changes to relevant regulations, guidelines, processes, and practices. The Alberta Clinical Health Research Digest is a bi-monthly roundup of clinical health research successes, impacts, announcements, and events occurring within Alberta. The first issue is coming the week of May 13, 2019. You can suggest news by emailing us at acrc@albertainnovates.ca. Our partners recognize the ACRC Alberta definition of clinical health research., as follows: Clinical health research has the goal of improving the diagnosis, prevention and treatment (including rehabilitation and palliation) of disease and injury, and improving and evaluating the health and quality of life of individuals. Clinical research is conducted on, or for the treatment of human subjects. Clinical research includes living human subjects, human tissues, human remains, cadavers, biological fluids, embryos, fetuses and patient information. Excluded from this definition are in vitro studies that utilize human tissues that cannot be linked to a living individual. This includes clinical trials on patients, epidemiological and behavioral studies, outcomes research, health services research and population health studies, typically falling under the CIHR rubric of pillars 2, 3 & 4. Share your experience on conducting clinical health research in Alberta. Download and submit our feedback form.